NAIROBI (HAN) October 27.2017. Public Diplomacy & Regional Security News. 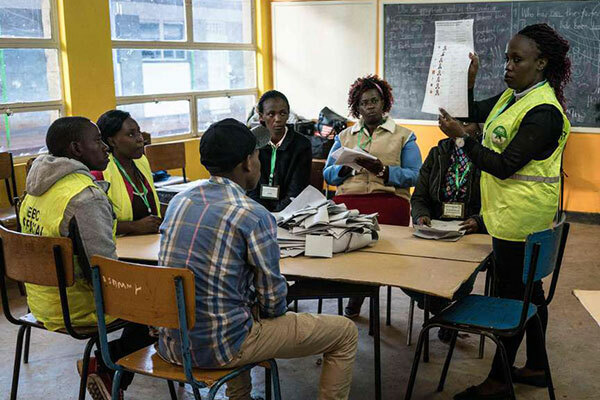 As polling officials tallied votes, Kenyans on Friday counted the cost of a deeply-divisive election marred by an opposition boycott and protests that left at least four dead and scores wounded. The country’s second presidential election in three months plunged into chaos on Thursday as supporters of the opposition National Super Alliance (Nasa) leader Raila Odinga attempted to block voting, clashing with police who fired tear gas, water cannon and live bullets. The election came after a two-month political drama that began when the Supreme Court overturned the August 8 victory of President Uhuru Kenyatta due to “irregularities”. However, although the ruling was initially hailed as a chance to deepen democracy in one of East Africa’s most stable nations, its impact quickly soured, unleashing weeks of angry protests, acrimonious political rhetoric and intimidation of election officials. And Mr Odinga’s boycott of the re-run, on grounds the election commission had failed to make the necessary changes to ensure a free and fair vote, has assured Mr Kenyatta a landslide victory. But as polling officials carefully counted the ballots, some under close police protection, difficult questions remained over the credibility of an election boycotted by a large part of the 19 million registered voters. Estimated figures compiled by the election commission pointed to a turnout of just 48 per cent. If confirmed, it would be a huge fall from the nearly 80 per cent rate in the August poll, which was won by Mr Kenyatta but overturned by the Supreme Court in an unprecedented ruling that has sparked weeks of protest and acrimonious debate. Election chief Wafula Chebukati said the ballot would be postponed until Saturday in four protest-hit counties in the country’s west: Kisumu, Homa Bay, Migori and Siaya. But Governor Anyang’ Nyong’o of Kisumu, an opposition stronghold in western Kenya where violence raged on Thursday, rejected the move, saying people would not vote while they were “mourning”. He said he had invited Mr Odinga and Nasa top leaders to visit the city on Friday. At least four people were shot dead and around 50 others wounded, most of them by live bullets, on Thursday, according to an AFP tally of figures from officials and medics. At Kisumu’s Jaramogi Oginga Odinga Teaching and Referral Hospital, an AFP correspondent saw several people arriving covered in blood. One of the dead was 19-year-old George Odhiambo who died from blood loss after being shot in the thigh during clashes in Kisumu, police and hospital sources said. And a fourth man was shot dead in Nairobi’s Mathare slum, another hotspot in the capital where police fired water cannon and tear gas to disperse demonstrators. The crisis is the worst since a 2007 election sparked politically-driven ethnic violence that left over 1,000 dead. In the August 8 election, turnout was nearly 80 per cent among the 19 million registered voters. Mr Kenyatta secured victory with 54 per cent of the vote, while Mr Odinga came second with 45 per cent. Mr Odinga, 72, is a veteran opposition leader who followed in the footsteps of his father and inherited a dynastic rivalry with Mr Kenyatta whose father was the country’s first post-independence President.